Norovirus, the dreaded illness popularly known as the “stomach bug,” is the leading cause of gastrointestinal upset in the US. According to the US Centers for Disease Control and Prevention (CDC), there are 19 to 21 million cases of norovirus in the US annually. The highly contagious virus is an unwelcome visitor in schools, day care and elder care settings, offices, sporting venues, cruise ships and more. Norovirus presents the greatest health risk to young children and the elderly. Globally, the economic burden of norovirus hovers around $60 billion in healthcare costs and lost productivity. Is quickly and profusely shed through diarrhea and vomiting. Only requires a minimum of about 18 viral particles to infect an individual (up to five billion infectious doses are present in each gram of feces from an infected person). Is environmentally stable; it can survive both freezing and heating, although not thorough cooking; it is resistant to many chemical disinfectants; it can persist on surfaces for up to two weeks. Rapidly evolves before the population develops immunity. Is associated with a low mortality rate. Of nearly 700 million annual cases of norovirus worldwide, there are approximately 219,000 deaths, a mortality rate of only about 0.031%. Its low mortality rate helps keep the virus alive and spreading to others. Given these characteristics, norovirus will continue to be a force to be reckoned with at least until a successful vaccine is developed and disseminated. In 2013, a team of public health and consumer advocates was convened by the American Chemistry Council’s Chlorine Chemistry Division to develop a set of clear instructions for disinfecting surfaces against norovirus using appropriate solutions of chlorine bleach. The need for simple-to-follow directions was great, according to a request from the New Jersey Somerset County Department of Health. The ad hoc task force included representatives from the New Jersey Somerset County Department of Health, CDC, the National Environmental Health Association, the Water Quality and Health Council and the American Chemistry Council. The posters developed by the group are available on the “Resources” page of the Water Quality and Health Council website, and have been downloaded tens of thousands of times. 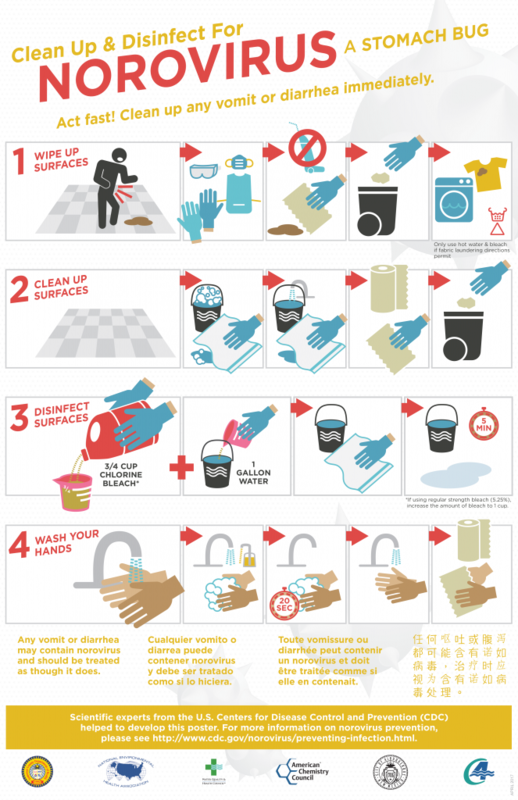 Discussions at the Albuquerque Norovirus Conference in the summer of 2016 identified the fact that some food industry and other workers do not read in any language (not even their own), prompting the need for a set of norovirus “pictogram” posters to illustrate with as few words as possible norovirus surface clean up and disinfection steps. The ad hoc group that developed the first set of “language” posters (now in English, Spanish and French) reconvened and welcomed the input of our colleagues from the City of Albuquerque Environmental Health Department in developing the new poster resource. 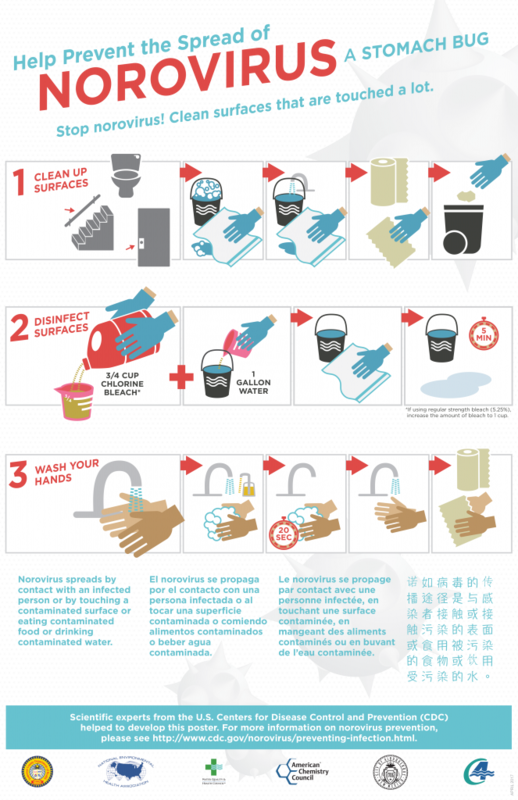 The pictogram posters, illustrated at the top of this article, are the proud product of our careful collaboration, and join the “language” posters as freely downloadable resources from the Water Quality and Health Council website. It is our sincere hope that all of these posters will be used widely to help curtail the spread of the notorious norovirus.